Monsoon is the best time to enjoy delicious and spicy snacks that you have always craved for. The season adds an extra flavour to these snacking items. Don’t you agree? Well, try these snacks and you will definitely agree with us! Aloo and kanda bhajiyas are synonymous with rains. Lip smacking bhajiyas and hot tea is something relish this monsoon. Nothing can beat the combination of hot bhajiyas and tea. Give it a try! Bhutta! The name itself is enough to water our mouths! The spicy and tangy bhutta is surely a snack that you can’t miss during the monsoons. To top it all, bhuttas are a healthy snacking item. So, don’t forget to enjoy this healthy and equally tasty snack this monsoon. The aroma of freshly fried samosas is amazing. Samosas are one of those snacks which taste the best when eaten hot. So, don’t forget to try hot and spicy samosas. It will definitely be a treat to your taste buds. Yes! We know Pani Puri is an all season snack but as we said earlier, the joy of having pani puri in monsoons increases two-fold. 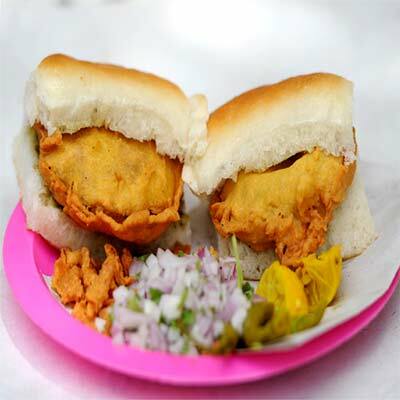 Vada Pav might not be commonly known snacks everywhere, but Mumbaikars know the importance of the local vada pav! Apart from satisfying your sudden hunger pangs, vada pav qualifies to be a great monsoon snacking option.